Aunt May, J. Jonah Jameson, Betty Brant. This is the first issue since #12 that Flash and Liz have not appeared in. Spider-Man says that Ringmaster makes “Thor sound like a teenager”, even though Spider-Man and Thor have never met. Jameson announces that he is not going to spend so much time attacking Spider-Man from now on. Nothing follows from that in this issue, and next issue he is back to attacking him as usual. 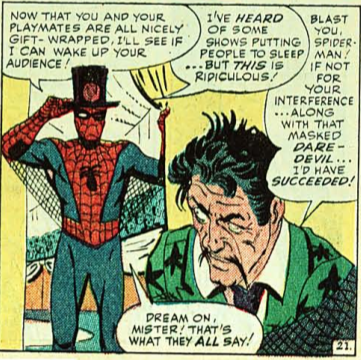 Unlike Doctor Octopus, Mysterio, the Green Goblin and Kraven, the Ringmaster has no particular interest in Spider-Man. Having the power to command huge groups of people to do exactly what he wants, he has very reasonably decided to focus on small-time property crime, and come up with a very practical scheme. He gets lots of people to come to his circus; he uses the Science Hat to send them to sleep; and while they are asleep he steals their wallets. Simples. Being naughty, the Ringmaster puts up posters saying that Spider-Man will be guest starring in his circus, to ensure a full house, and even claims that the proceeds are going to charity. But “he makes one small miscalculation! He didn’t stop to think what might happen if Spider-Man himself saw the ad”. Duh! Almost as silly as missing out on becoming Supreme Crimer because it didn’t occur to you that a cave in New Mexico might have a big green monster living in it. Spider-Man does see the ad, and decides that he’ll surprise everyone by putting in an appearance at the charity gig. 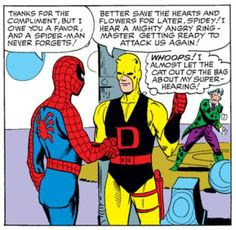 And who should be in the audience but newish hero Daredevil, still resplendent in his original yellow uniform. Daredevil is, like, blind. 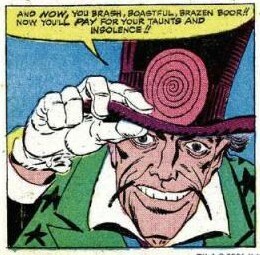 Did I mention what you had to do to avoid the power of the Ringmaster’s mind control spirals? Stan Lee loves to have characters from one comic book appear in another comic book: partly because he wants to weave his titles together into a single Marvel Universe; partly because he wants to promote less popular titles in better selling ones; and partly because it’s fun. Up to now, the guest appearances in Amazing Spider-Man have largely been told from Spider-Man’s own point of view. The Human Torch and the Fantastic Four are less “special guest stars” as occasional members of his supporting cast. The Human Torch presents to us, as he does to Spider-Man, as an arrogant, entitled, rich kid — even if we readers know how brave and heroic he can be in the pages of his own comic. The Hulk is just a monster living in a cave. “You think I’m a brainless fool! If you only knew the truth!” he explains. If you don’t happen to be a reader of the Mighty World of Marvel, then you have no more idea that Spider-Man about what that “truth” might be. 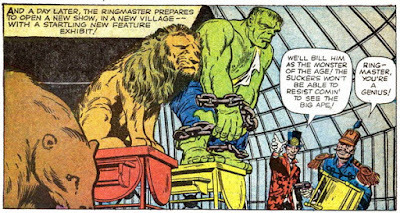 There is no problem in getting Spider-Man to tackle Daredevil: indeed one wonders if the reason for using a minor Hulk villain like the Ringmaster as the antagonist was precisely so that he could use his Science Hat to force the Man Without Fear to fight the Web Spinner. But mind control and amnesia are two of the most boring tools in the writerly trick basket. There is a certain amount of fun to be had in watching two heroes leap to the wrong conclusions about each other: but it’s not that much fun to watch Spider-Man hitting Daredevil because the Ringmaster's Hat has reduced him to a spider-zombie. 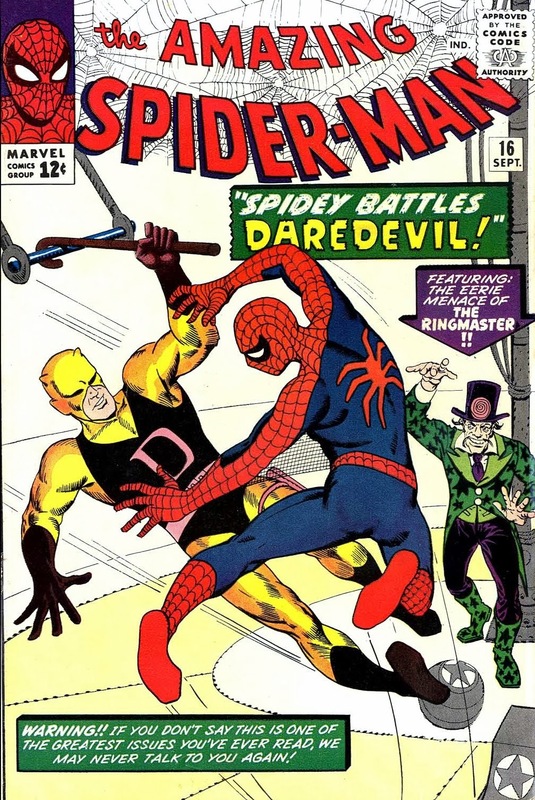 At the beginning of the story, Spider-Man bumps into Matt Murdoch while stopping a burglary (Matt had been planning to stop it himself); Spider-Man notices Matt in the audience of the circus; and Matt even applauds, in Daredevil’s voice, when Spider-Man defeats the Ringmaster's friends. Spider-Man knows that Matt is blind; he knows that Daredevil is the only one unaffected by the mind control; and the only way he knows to remain unaffected is to shut his eyes. There is nothing actually dreadful about this story, but it feels awfully like a filler between the four “villains” issues and the magisterial triptych with which we are going to wind up our second spider-year. “If you don't say this is one of the greatest issues you’ve ever read, we may never talk to you again” enthuses Stan on the splash page. In that case, we’d all better shut up, hadn’t we. Strong agreement. Spider-Man is very rarely boring, but this issue manages it. The Ringmaster is second only to The Enforcers in being a completely inadequate bad-guy for Spidey to fight. (Honourable third place: Kraven.) The difference is that the Enforcers issues at least have something else going on. This time, not so much. I think that teams of villains are hardly ever interesting. The Masters of Evil in the Avengers and the Frightful Four in the Fantastic Four were always unbearable; the villains either spent the issue explaining their plans to each other, or, worse, bickering. Fair comment. The problem with the Fantastic Four is that there are four of them, and it never seems quite fair when they all gang up on (say) the Submariner.